Our largest version of the Reverse Flow models! 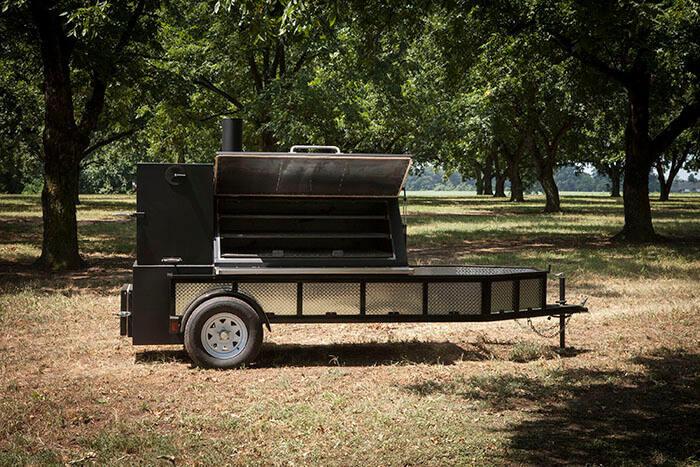 This unit has the capacity for food storage and to cook for the large Caterer or the large backyard party cook. 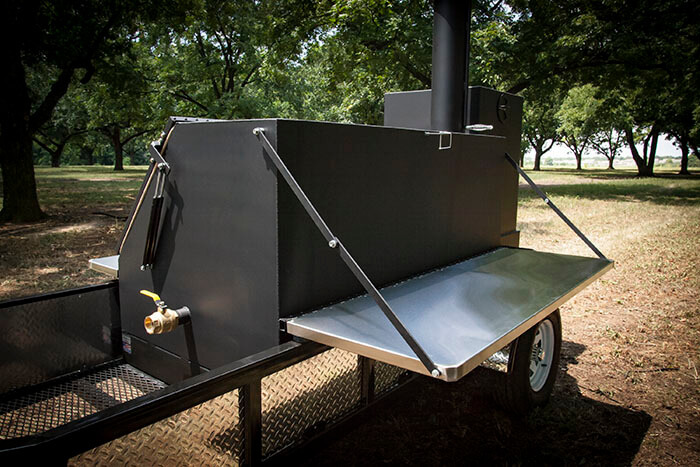 Like the other models of our Reverse Flow Smokers this unit is ideal for the cook who want to cook on a large scale. What is a Reverse Flow Smoker? 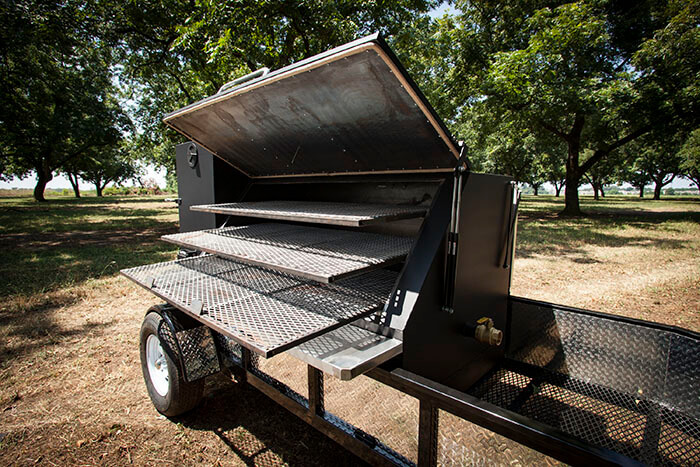 A Reverse Flow Smoker is an indirect heat smoker. This means there is a fuel off to the side and natural air movement and draw is used to move the heated air thru into the cook chamber. As it is drawn along under our vallified diverter plate the heat is evenly distributed across all areas of the cooker’s bottom pan as it moves under the plate to the end, then it reverses itself and flows (thus the nick name reverse-flow) and drafts back over the top of the heated diverter before exiting through the smoke stack. How does a Reverse Flow Smoker work? The amount of “fire” is controlled by the amount of oxygen that is allowed in from the adjustable air dampers on front of the firebox. In this type setup the fire basket-full of fuel can all ignite at one time because oxygen is more prevalent in this type setup. So the burning area of fuel is of greater proportion in fire basket. 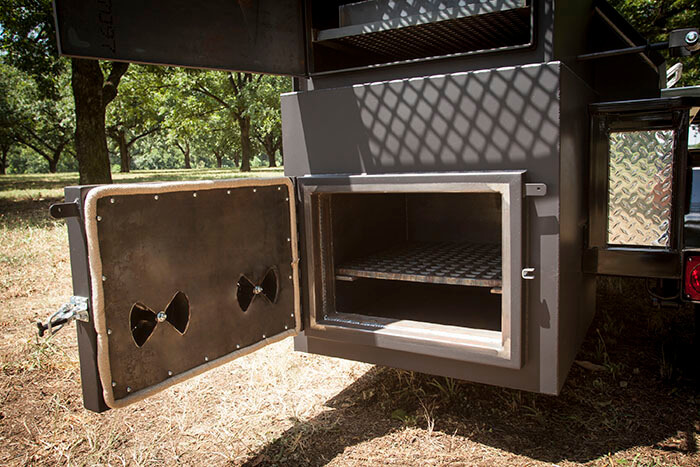 At the rear of the firebox there is a opening that allows the heat/smoke to transfer from the firebox into the cook chamber. The heat/smoke moves through the cook chamber in a Reverse Flow Smoker much faster, therefore the cook chamber tends to be a drier environment thus lending for a lower and slower approach to create a nice moist cooking environment that doesn’t tend to cause meat to dry out as it is cooking. 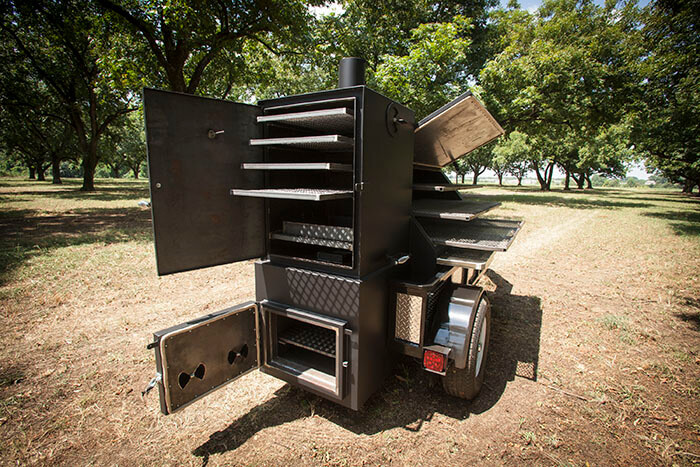 What is the best way to start a fire in my Smoker? 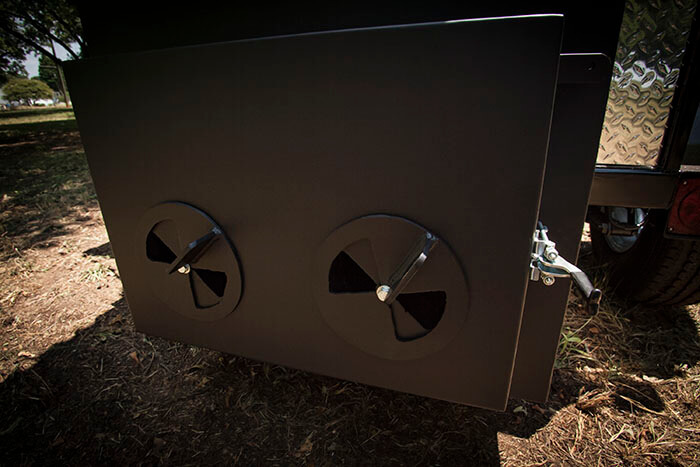 Begin each new fire with the firebox door and chimney damper in the open position, this will facilitate more airflow in the fire building process. 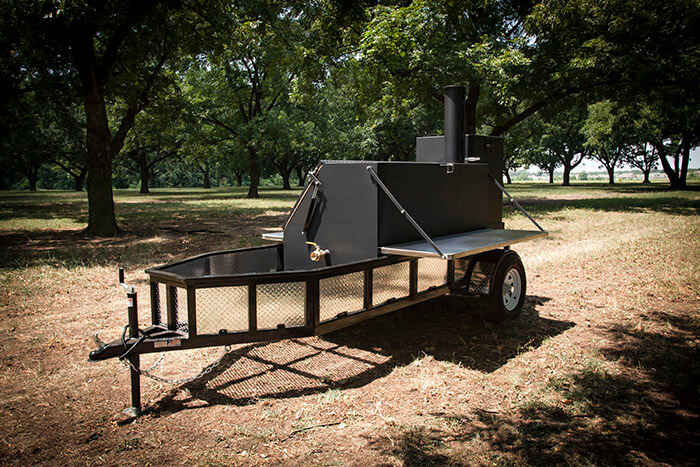 Reverse flow Smokers use charcoal as the base and wood a s the secondary component of their fire. therefore we recommend to always start your fire with just charcoal. Once you have a hot bed of charcoal, you can place two pieces of wood onto the coal base and close the door. As the wood reduces to coal close both dampers to the halfway position to allow the pit temperature to begin to rise. 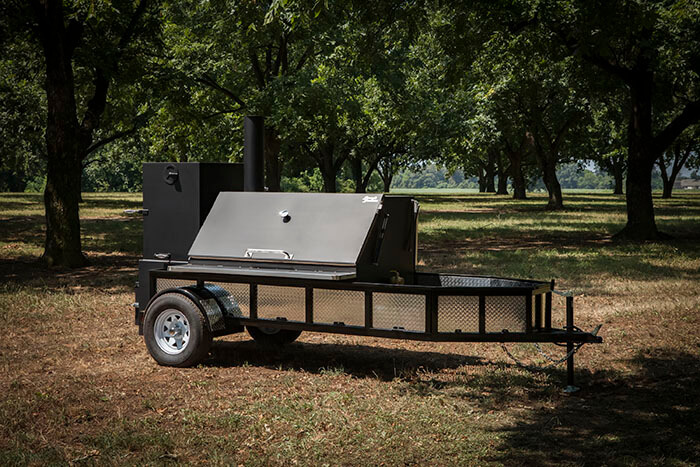 Once the pit stabilizes at the desired temperature, add your preferred mixture of charcoal and flavor wood and you are ready to begin cooking. What are the best combinations of Charcoal/Wood to use? Wood selection is a matter of the Cook’s palette. Therefore, we have included some basic guidelines for selection. A wood that is going to be used should be either fruit or nut bearing. The most prevalent smoking woods include oak, hickory, pecan, peach, apple, cherry, and mesquite. The fruit woods produce a mild flavor with a slightly sweet finish. 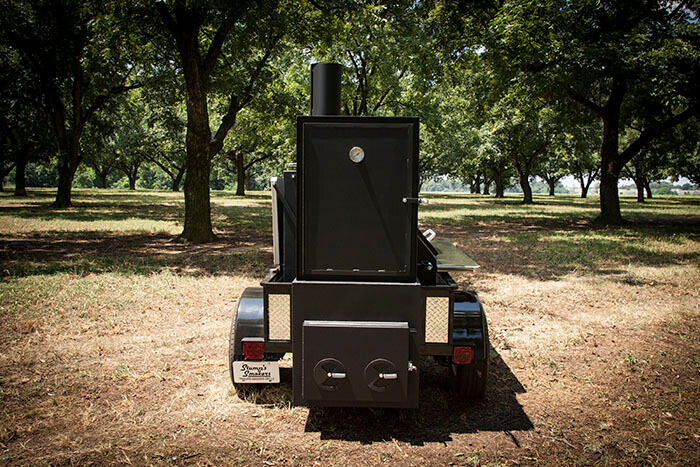 The oaks and other hardwoods produce a heartier smoke flavor and pecan can influence some meats with a hint of sweet. Flavor wood will also influence the color of the meat. 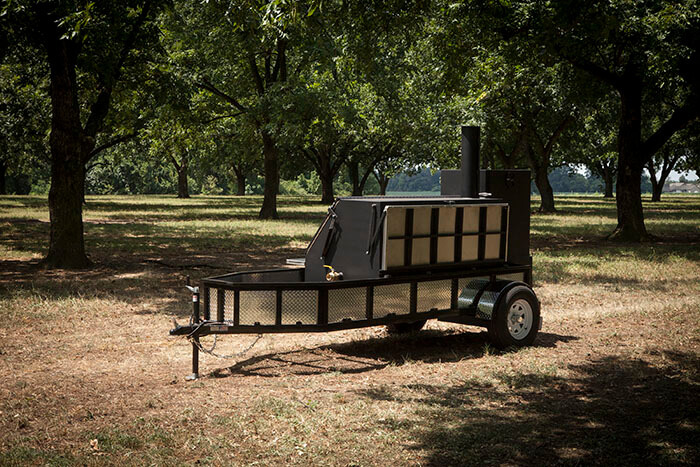 Some pit-masters like to mix cherry and pecan which produces a cherry like color on the bark and a slight sweet smoke flavor. The other consideration when selecting wood is seasoned vs. green. 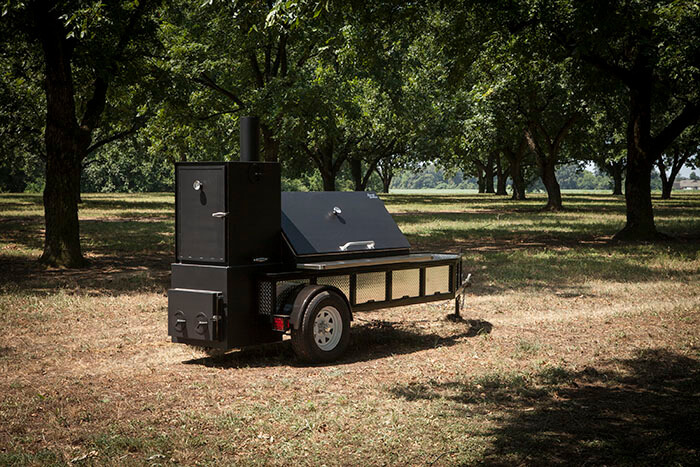 Experienced pit-masters choose seasoned wood. Seasoned wood burns more predictably, which contributes to a cleaner burning fire and minimizes temperature spikes making pit management easier. How do I season my new Reverse Flow Smoker? Build a fire in the firebox utilizing good natural grade of charcoal (preferably oak or hickory). run the Smoker up to around 300 degrees and allow to cook for 3 hours. We normally prefer to use cooking oil on the racks and diverter plate to insure a good even sheen and buildup on the surfaces. After the cooking time has expired, close off the valve and allow the smoker to come below 150 degrees internal temp. 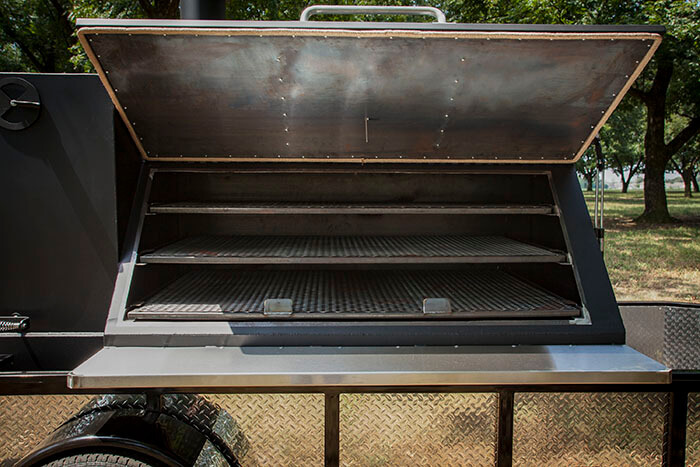 The pit is seasoned and ready to cook on when a thin pecan colored sheen has developed on the interior surfaces. 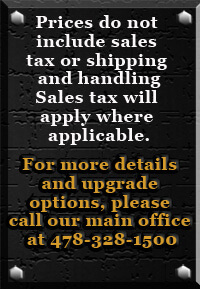 Receive great discounts and hear about new products!